"Grief is a most peculiar thing; we're so helpless in the face of it. It's like a window that will simply open of its own accord. The room grows cold, and we can do nothing but shiver. But it opens a little less each time, and a little less; and one day we wonder what has become of it." "Destiny isn't always like a party at the end of the evening. Sometimes it's nothing more than struggling through life from day to day." "We don't become geisha so our lives will be satisfying. We become geisha because we have no other choice." I have such a difficult time summing up a book as rich as this one. The characters were so dynamic and well-developed and the insight into geisha life and Japanese culture was utterly fascinating. The writing style, though a little dense to wade through at times, is full of lovely imagery and carefully-crafted word choice. And the book deals with such important themes, namely love, life, identity, true beauty, relationships, character, and destiny. "I couldn't hear their voices any longer; for in my ears I heard a sound like a bird's wings flapping in panic." "His face was very heavily creased, and into each crease he had tucked some worry or other, so that it wasn't really his own face any longer, but more like a tree that had nests of birds in all the branches." There were a couple of times I was quite shocked while reading the book, and marveled that people could be as cruel as Arthur Golden depicted. 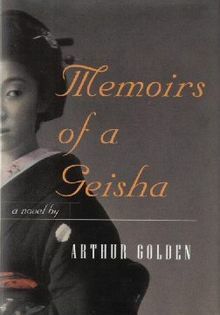 I was amazed at what many of the geisha had to endure, and surprised at what was considered normal within that culture. Other cultural things were really interesting to me, like how superstitious the geisha were and what was expected behavior between men and women during that time. I was astonished at how much work went into being a prominent geisha, from the makeup and hair to the dances they learned and instruments they played. I also loved reading about the traditions, like the tea ceremony. Although interesting, the plot (especially the first third of the book or so) was somewhat slow. Overall, I really enjoyed the book and the characters, but couldn't give it a five-star rating because the book seemed to drag in some places with the depth of information the author was trying to convey. However, it's a book I've been meaning to read for some time, and I'm really glad I did.